Everyone knows this part. It’s the beginning of Inferno. 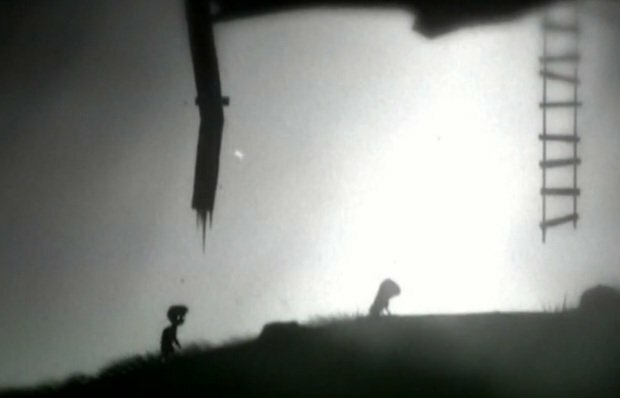 This was the first hint that Limbo was really a parallel to Inferno. What comes immediately thereafter, however, fits so perfectly that I don’t think it can be coincidence. a bitter place! Death could scarce be bitterer. I must talk about things other than the good. There are some obvious connections here, I think. 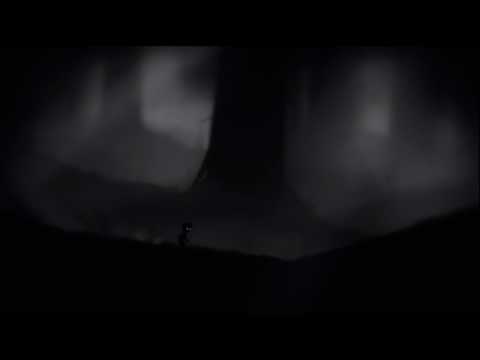 The entire game is dark, shrouded in shades of black and white, and it begins in a particularly dark forest (see the above screenshot). Beyond that, however, the concepts of wild savagery and bitter stubbornness are introduced. To illustrate the savagery aspect, one need look no further than the various humans you come across in the game. With the exception of (presumably) the boy’s sister, the only other people you see in the game are essentially “savages.” You come across several dead bodies, most of them your size and not the taller size of the living folks you see, and the implication is that these natives killed them, probably with spears, bear traps, and other brutal mechanisms. When you physically approach these people for the first time, they try to kill you, too, and you can only escape by running away and leading them into vicious traps that squash, stab, or dismember them. “Savage wilderness” only begins to describe it, though. Essentially, everything in Limbo can (and will) kill you. 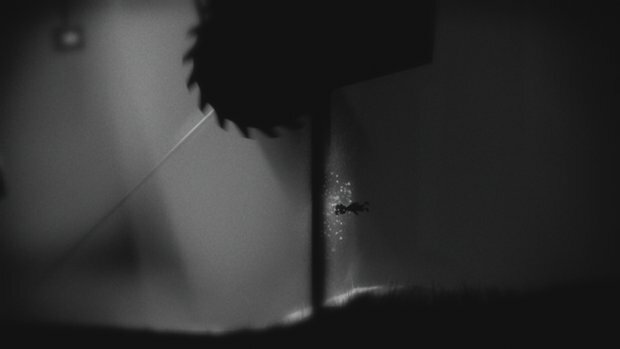 Falling boxes, Indiana Jones-like boulders, giant spiders, bear claw traps, automated machine guns, people with spears, electrically charged metal rods, and spikes are just among a few of the perils that await in the world of Limbo. You can’t even swim; the first time you step into water over your head, you realize that you sink and drown. The entire world is literally out to get you. 1) This is “the beast” introduced in the beginning of Inferno that forces Dante into hell in the first place. 2) The spider represents the Cerberus, the guardian of the third circle of hell, gluttony. I think that the spider is the Cerberus, marking the boy’s journey through the first third or so of the game and into the real “circles” of hell. There are a few reasons for this. 1) It’s the first (and only) huge monster you ever see, just like the Cerberus in Inferno. 2) In order to defeat the spider, you have to roll a giant boulder into its head. In order to get past the Cerberus, Dante had to hurl wet earth into its mouths. The act of introducing earth to the beast in order to pass is essentially the same. 3) Very soon after you defeat the spider, you activate a weather machine that makes it rain. Afterwards, you flee into caves and wet marshlands. The third circle of hell is marked by brutal, icy rain and the fifth is marked by a swampland, mirroring the transition and timing almost identically. It does seem that the transition between circles, the change in geography, and the timing of the spider encounter matches up well enough to be seen as a loose parallel to Inferno. In the very beginning of the game, one of the first things you do is cross body of water in a boat. This could just be a lake, river, or otherwise, but its placement at the very beginning of the game, prior to the real horrors you encounter, suggests that this is a parallel to crossing the river Acheron. This lends credence to the idea of circular progression: Waking up in the forest, crossing Acheron, encountering the Spider/Cerberus in the third circle, and entering the fifth circle of swamps and anger (anger, because this is where the other humans try to kill you). Since Acheron divides the realm of the living and the realm of the dead in Inferno, this also suggests something else important to this interpretation of Limbo: The main character is dead. More on that later. Beyond the horror, death, monsters, and progression of circles, there’s another parallel aspect to Inferno, but it’s far subtler: The butterfly. It’s so unobtrusive that I could only find a single, grainy screenshot of it. See the white speck to the right of the broken pipe, just over halfway up in the screenshot? That’s the butterfly. I think the butterfly is Virgil, Dante’s guide through the Inferno. 1) It’s the first moving thing you see upon waking and it guides you to the right, representing Virgil guiding Dante. 2) You see it at the absolute beginning and end of the game, as well as at several points in the middle, indicating that it’s always somewhere nearby even if it disappears for lengths of time. 3) It’s always present when you see the girl (who is presumably your sister), indicating that it’s linked to her the same way Virgil is linked to handing Dante off to Beatrice. Finally, completing the journey is the boy’s progress through the later circles of Inferno, including the City of Dis. These are the mechanized areas of the game, complete with city backdrops, electrified rails, magnets, and massive gears and cogs. This starts with the seventh circle, violence, and goes through fraud and treachery, which we’ll get to in a minute. Why violence here and not earlier when the people were trying to kill you? Tribal murderers fall under acts of anger, but for violence you get something far more extreme: automated machine guns. You no longer have angry people defending their territory or whatever, but instead you have pure mechanisms of wanton violence designed to obliterate everything animate and inanimate in their path. The 8th circle is reached by descending a vast cliff, just as the further reaches of this City of Dis in-game are reached by jumping down a huge chasm with pipes, rope, and buzz saws. Finally, the 9th circle is ringed by giants, just as the end of the game is marked with huge gears that dwarf the main character and are never completely visible on screen because of their size. The gears are essentially automaton giants guarding the final areas of the game and, ultimately, the last pane you have to break through to beat the game. 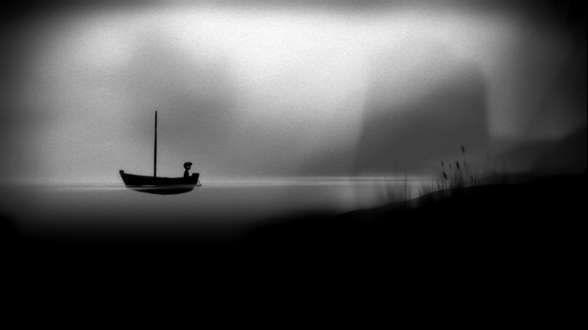 The ending of the game is less about how I think Limbo is a parallel to Inferno and more about how this is the twist that sets it apart. For the final puzzle, you have to flip gravity in several clever ways to navigate around buzz saws, ultimately falling sideways through what appears to be a large pane of glass separating the mechanized factory from a forest not unlike the place where you started. As you are launched through this pane, gravity returns to normal and you fall to the ground, sprawled out in impossible ways. You don’t (and can’t) get up for several seconds. To me, this makes it pretty clear that if you weren’t already dead, you are now. From this point, you walk to the left, encountering Virgil the butterfly one more time before you see (presumably) your sister. She’s sitting motionless looking at a mass on the ground that’s buzzing with flies. She apparently hears you approach, or at least hears something, and stands up but doesn’t turn around. 1) Since the last circle is treachery and the one before that is fraud, it’s possible that the real, underlying story is that your sister killed you. At the beginning of the game, you are dead. You cross the river Acheron and pass through the circles of hell to escape. You are dead, but your essence escapes Inferno. Your sister senses her dead brother’s ghost and stands up, suddenly realizing her sins and her fate. 2) Your sister is also dead, but didn’t necessarily realize it yet. You traverse Inferno, just like the previous explanation, and when you reach your sister she suddenly realizes the truth. The final moments represent the haunting conclusion that you are both dead. 3) Your sister is dead, but traversed Inferno before you. The journey through hell was a spiritual one and you returned to Limbo when it was complete, hence seeing your real sister and what is most likely your own dead body. She was waiting for you to guide you along the next stage of the afterlife, like Beatrice in the Divine Comedy. 4) It was all a dream. 5) It was all real. It was just a scary forest and your sister was kidnapped by crazies. She survived and you just had to navigate a treacherous world to get to her. I just think those are too literal, too basic to be believable. Then again, there might be no story at all. 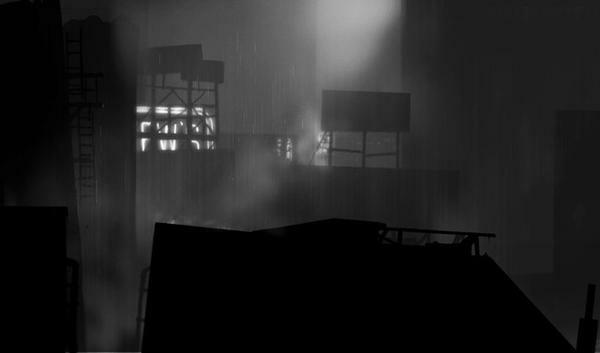 Maybe Limbo is just supposed to be a horror puzzler in black and white and that’s it. Since the developers of the game remain intentionally tight-lipped on the matter, we may never know. 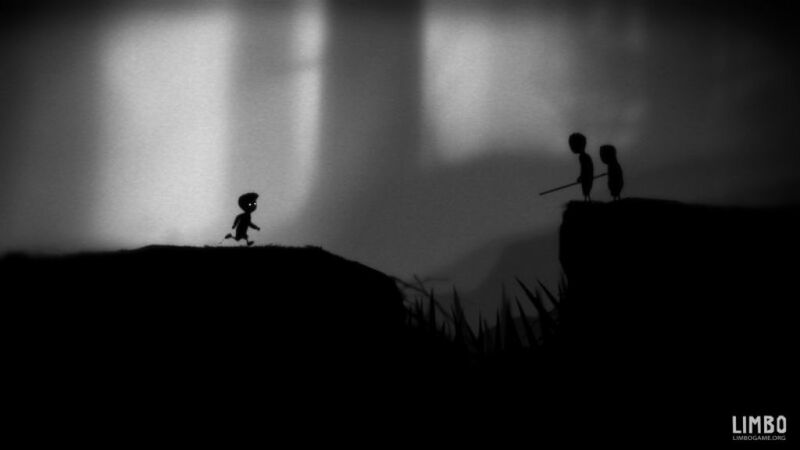 Limbo is available now on the Xbox 360, Playstation 3, and Steam networks for an MSRP of $14.99. Excellent post. I’ve been meaning to play this game. I’ve watched my boyfriend play parts of it and that alone was quite unsettling. The way you’ve connected it to Dante’s Inferno makes it even more alluring. I agreed with you up to the very ending. But I think that you should’ve gone further with the treachery allegory. The boy sneaks up on the girl, and they both stand there, fade to black. Credits, main menu again, and in both places they have been standing just moments ago are flies. I agree with you that it is Dante’s Inferno. However, I think the boy actually began his way in Limbo as a dead child. He goes looking for his sister in hell, and finds her in the ninth circle of traitors. We pretty much know for a fact that both are dead, because the menu scene is indisputable as to what it implies; therefore, I think the boy committed suicide, which is why he arrived at Limbo, whilst the girl committed treachery, which is why she is in the very bowels of hell. So my theory, as far fetched as it may seem, still connects all these possible dots. It is this: somehow, in that tree house, the girl betrayed the boy. Maybe she tried to kill him, I don’t know. Something very Lord of the Flies may have happened. The boy, upon realizing this treason, killed her, but somehow it wasn’t a sin – therefore, it may have been self defense. Upon realizing what he had done and out of the deepest regret, the boy killed himself and ended up in Limbo as a suicide would. He crosses the river (river Styx according to Greek mythology by the way – the boat-man is Acheron if memory serves), goes through hell to find his treacherous sister. The most subjective part is that I believe this to be a fairly happy ending. In this act of forgiveness the sister is redeemed. They are still corpses under a tree, but the brother had looked for his sister to forgive her, therefore redeeming her and freeing her from the ninth circle. Maybe in forgiving her treason, she gets to go to heaven. I dunno. What I do know is, this pretty much connects all the dots, and is a solid, well rounded theory. I like it. Thanks for the article, it really helped me make up my mind about this. Thanks for the really thoughtful reply! Your conjecture certainly seems to add quite a bit and I can’t see anything wrong with it as another possibility. Again, I like your theory and thank you for commenting! I hope you continue to enjoy the blog. One issue I see with this theory being in line with Dante’s Inferno is that those who commit suicide are not sent to the 1st circle (Limbo) but instead to the 7th (violence against self). Limbo in the Divine Comedy is for virtuous non-Christians. This is a good game however i can find it a bit repetitive at times and soon enough i cannot continue to play it , i think i find it a quite slow moving game to be honest. I very much like this interpretation. 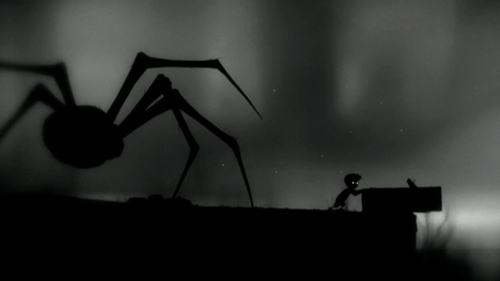 With a game titled LIMBO, I feel it’s impossible to not reference Inferno. I just want to add that the gravity themed puzzles at the end also fit in line with the inversion of gravity after Dante exits Hell by passing through the center of the earth, right before you break through to the end of the game. This inversion causes Dante to think in fact they are returning to Hell (just as perhaps you thought the game was starting over), but in fact they exit to Purgatory and then Heaven. I think it’s pretty clear from the title screen that both you and your sister must be dead (two masses of flies on the ground, from falling out of the treehouse or something; it doesn’t matter how in my mind). Based on this information, only endings 2 or 3 seem viable. Personally I like the 3rd as it fits best with the rest of the Inferno. And if your sister represents Beatrice, it’s not necessary that she traversed the Inferno before you. She could instead just be waiting to reunite with you at the end of your journey.